For about 2 and a half years now I've been blogging. And I kinda like it. I'm learning a lot. And I like to share what I'm learning. I hope you like what I'm sharing. I was invited by Christina Berry of The Lazy Pitbull to answer 3 simple questions about my writing process. You can check out her post by going to her website. So I am going to answer the same three questions, and afterward I will tag three people to answer the same questions. Then they'll tag three people, and so on and so on and so on. 1) What am I working on? Lots of stuff. I checked and I have several different posts in drafts. I have a habit of starting on something and stopping, then working on something else and forgetting all about the other story. One, for instance, seeks to ask why some dogs like to cuddle and some don't. Another looks at hounds in the military. I also have an advance review of "The Dogs Were Rescued (And So Was I), Teresa M. Rhyne's follow-up to the best-selling "The Dog Lived (And So Will I)." I also want to start looking into stories for the fall, including Halloween, Daylight Saving Time and Pet Diabetes Awareness Month. 2) Why do I write what I do? Would you believe I'm still trying to figure this out? lol. 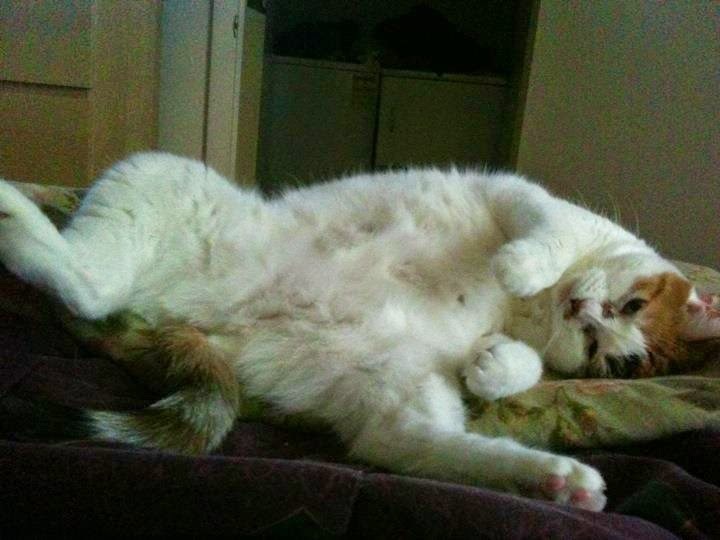 I started the blog because I wanted to chronicle my adventures as a new pet parent. But those stories have fallen by the wayside. I'm not an expert by any means, and I still base a lot of what I write on what I'm learning. A lot of what I write about is based on interest of the topic. Anything beagle is of course fairgame! 3) How does my writing process work? Well, maybe 80 percent of my process is research. I'm constantly looking for info and storing for stories in the future. I have lots of emails full of links. Eventually I get to those stories. I try to find experts for my interviewing. Then comes a lot of staring at the computer screen. Then getting up and walking around. Then going to work. Then staring at the computer screen at work in between writing stories for work. And driving around, writing in my head. I write a lot in my head. Then eventually I put those stories on the "paper." But the process is not done. I try really hard to include pictures that work for the stories rather than random pics. That also takes a lot of time. And I will go back over a day and edit and re-edit. So my stories are never really done. But I've learned that if I didn't let my ideas out before I was finished, they would never see the light of day. Three lucky bloggers have agreed to take part in the #MyWritingProcess Tour. Please check out their blogs. Flea Christenson: Flea is the awesome blogger from Jones Natural Chews. She shows us how these awesome treats make dogs happy. Plus, she has her own dogs. And ducks and chickens and things. Lee Allport: Lee is an Orlando-based blogger. She does entertainment and product reviews. Her blog is crazy popular. She's a Nielsen Power Mom and a Huffington Post Blogger. We met at a Star Wars Disney press event (because I don't just like dogs). She's part of the reason I got into blogging. Her blog is My Sentiment Exactlee. Kelly Green: Kelly is another Orlando-based blogger. Her blog is about SeaWorld, and she's also a home school mom. She and her son go on all kinds of adventures. She also does work with Give Kids the World, an amazing charity in the Orlando-area that provides vacations for sick kids and their families. I met her through Lee. Her blog is SeaWorld Mommy. Last night I read something that raised my hackles. 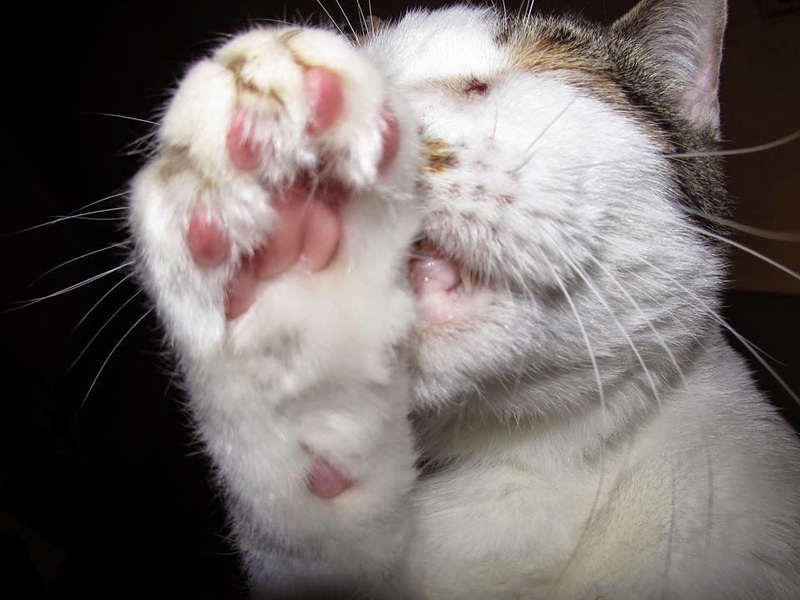 It's an article on BlogPaws.com called "Top 5 Reasons You Do Not Deserve a Pet." Now, there's a lot in this article I agree with. A pet is a lifelong commitment that shouldn't be entered into lightly. You should consider the cost of owning a pet, the fact that they grow up and get old, that the "newness" and maybe even the "cuteness" will wear off. But the number 3 reason, "you work a lot of hours," really got to me. Because I do work a lot of hours. Oh, and to add to that, I'm single. I also don't have enough time to drive home and let the dogs out on a lunch break. And I don't have a dog sitter, and Lulu can't handle doggy day care (she can't handle an hour at the groomer). "I miss you when you go to work." So why bother having dogs? In both cases one of the reasons I did it was so the dogs would not end up rehomed or back in a shelter. Yes, in Lulu's case she also came to keep me company after my home was broken into, but my parents had also been asking me if I would be willing to take Lulu because they were having trouble with her. I did it because I love these dogs. I love Lulu and Jasmine. It would have bothered me less if the point was brought up in a "Reasons not to get a dog" story. Then the point reminds people that it can be a problem and you take it into consideration. It's the word "deserve" that bothers me. Like I don't deserve ice cream because I didn't eat dinner. That to me implies punishment. In fact, the very definition includes the word "punishment:"
to deserve exile; to deserve charity; a theory that deserves consideration. Besides, there are a lot of people in this world who are single and work full time. If we told all those people they couldn't own a dog, they don't deserve a dog, how many potential animal adopters does that ban from saving animals in shelters? Pets on death row are a much bigger problem to me than pets at home waiting for their owner. 1) Know your dog. I have a friend who has a German Shepherd mix. She takes her dog on 3-mile runs. Then he sleeps with the TV on while she's at work. Oh, and he's a puppy in a studio apartment. No problems. But she knows what she needs to do to make sure he's not a behavioral problem while she's away. Now, fortunately she's an active person (she ran the Boston Marathon and did Iron Man). So she wanted a dog who could run with her. If you're practically a couch potato like me, this wouldn't work. So know what is required to keep your dog happy and out of trouble BEFORE you get a dog. Lulu and a friend at the apartment complex dog park. 2) Keep your pets active. I take my dogs for walks. When Lulu and I lived in my one-bedroom apartment (a beagle in an apartment, heaven forbid!! ), we went for at least a 20 minute walk in the morning, one in the afternoon and one at night when I got home. We also had the dog park in the complex and the one about 15 minutes away and we used it frequently. Now I have a screened in patio and a backyard which will eventually get fenced in. And Lulu has Jasmine to run around with. They keep each other active. And they tire each other out. Then they relax throughout the evening while I'm at work. A tired dog is a happy dog. 3) Keep them mentally stimulated. I play games with my dogs. We do training stuff. I have puzzles and treat balls. It also aids in exhausting them while I'm away, but as long as they have things to do, they keep themselves busy. 4) Don't crate them if you can help it. 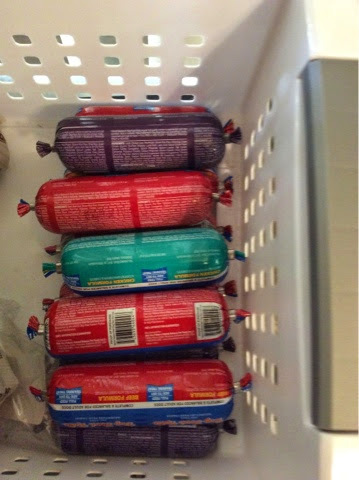 If you tire your dog out and give them things to chew on you shouldn't have to crate them all day. Then they have freedom of movement. Lulu since training has stopped chewing. Unfortunately with Jasmine I can't trust her not to get into a fight with Lulu. Jasmine has to stay in the crate. ADDENDUM: I just want to add that I don't dislike crate training, though I have a mental block about it. I prefer confining the dog to a space in the house rather than the crate. When I'm gone Lulu is confined to the kitchen, dining room, and my master bedroom. If I didn't worry about Jasmine and Lulu mixing it up I would let Jaz out of the crate. 5) Spend time with them on your days off. Take them places -- a walk on Main Street, the beach, the park or just for long walks. 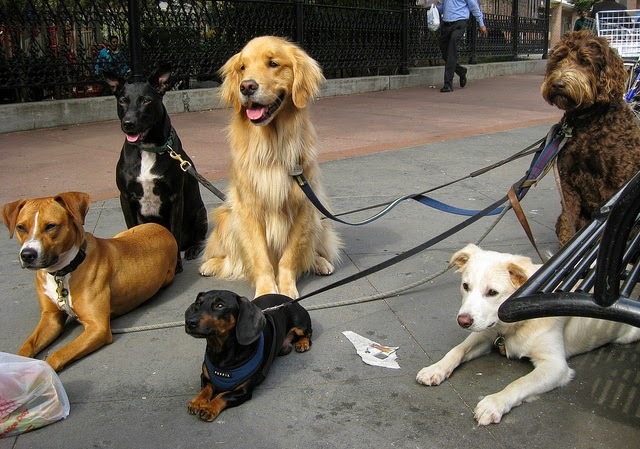 Make sure your dogs socialize with other dogs. Take them for classes. Do training, it helps bunches. Ideally, if I could stay home with my dogs all day, I would. The world isn't perfect, and we have to make do. It hurts me when Jasmine gives me the big eyes when she goes in her crate, or when I see Lulu's tail go down as I walk out the door. But I'd rather Lulu and Jasmine were at home waiting for me than waiting for someone to save them in a shelter. No it's not the perfect situation, but it is possible to make it work. I'm not the only blogger who feels this way. Check out Jessica Shipman's post over at Beagles and Bargains and Jen DeHaan's over at Dogthusiast. Please feel free to agree or disagree below. There are lots of ways to bond with your dog -- cuddling, playing fetch, going for a walk. But there's nothing quite like doing something outside the norm and experiencing something that's new for both of you. St. Augustine Eco Tours takes guests on a trip through the fragile ecosystem of the Matanzas Estuary. The tour group offers guided tours with boats, catamarans and even kayaks. Each tour is guided by a well-trained naturalist. The goal of St. Augustine Eco Tours is to show people the natural world of St. Augustine and how important it is to keep it pristine. And your dog can tag along. I didn't know how Lulu would handle being on a boat. She wasn't a fan of the water. I bought her a life vest but Captain Zach McKenna said it wouldn't be necessary. Lulu was fine getting on the dock until we got to the boat. Then she froze, her paws splayed out. The deck was crooked and the water was so close that it freaked her out (I told you she wasn't a fan). Capt. Zach helped me pick her up and put her in the boat. Turns out Capt. Zach was right. The boat, the Cetacea, was perfectly safe for Lulu, with an inflated bulkhead that was high and sturdy. The Cetacea is a rib rigid hulled inflatable boat and used to be used by the Secret Service. We departed from St. Augustine Marina and headed north, past the Castillo de San Marcos and out toward the Atlantic Ocean. The water was calm, there was a fair wind and the sky was a brilliant blue. Bring a really good camera! Photo courtesy of St. Augustine Eco Tours. We started relatively slow, watching for different estuary residents -- birds, turtles, manatees, jellyfish. But we were lucky this trip. 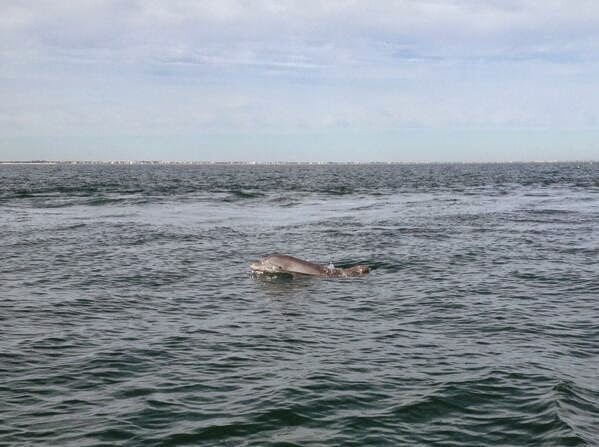 There's always a 50/50 chance that you'll see dolphins. We were surrounded. It's important to keep a distance from wild dolphins so we don't disrupt their movements. But we could see the pods, and when we stopped the boat, Capt. Zach would drop a device into the water and we could hear the dolphins moving around us. Lulu watched it all from a safe distance inside the boat. She didn't get up on the edge to look into the water, even when we weren't moving. But you could see she was fascinated. Her nostrils flared in and out as she tried to smell everything. Her ears flapped in the breeze as the Cetacea picked up speed and headed into the Atlantic. I held on to the seat for fear I might fall off as we flew across the water, but Lulu did just fine. On the way back though Capt. Zach stopped the boat and fished out a cannonball jellyfish. It's a big bulby looking thing, and it doesn't sting but it is a bit slimy. Inside there's a spider crab, a tiny creature that has had a symbiotic relationship with the jellyfish for centuries. And oh, yeah, they are eaten all over Asia. Tours take off from St. Augustine Marina every day. Each tour is guided by a well-trained naturalist. The goal of St. Augustine Eco Tours is to show people the natural world of St. Augustine and how important it is to keep it pristine. For more information, call 904-377-7245 or go to the St. Augustine Eco Tour website. 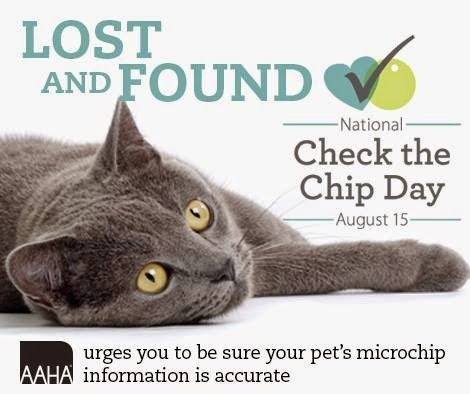 This day is sponsored by American Veterinary Medicine Association and the American Animal Hospital Association to remind people to make sure their pet's michrochip is working right and the information is up-to-date. A couple weeks ago we talked about the dos and don'ts of microchipping your pet. Today, we're going to talk about the five important reasons to make sure your pet's chip is working. 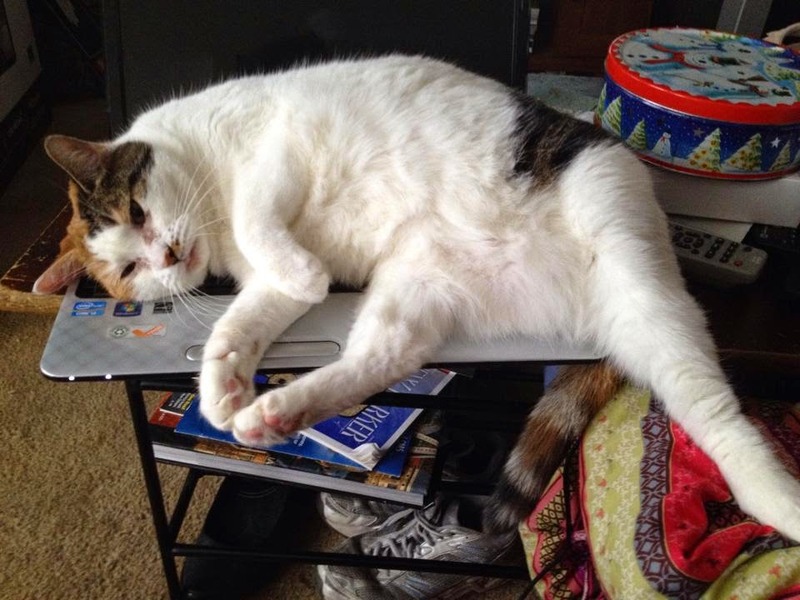 After, check out some of my other blogging friends on microchipping. 1) When was the last time you had the chip checked? Chips can malfunction, or scanners can lose the ability to scan them. If a scanner isn't properly reading your chip, the vet won't be able to find your contact info if your pet is lost. 2) Is your chip still there? Not all chips are built to prevent migrating, and some chips will migrate from their insertion point (usually around the shoulder blades). It's good to make sure the chip is still where it needs to be. 3) Have you moved? How many of us went back and updated our pets information on the chosen registration every time they moved? Heck, some people never registered the microchip in the first place! When the vet registers your pet's number, they can check it against the registries to make sure it is up to date. 4) Is your chip on the right registries? There is no universal registry, but AAHA is working with several microchip companies to get one together. That's the AAHA Universal Pet Microchip Lookup Tool. 5) When was the last time you took your pet to the vet anyway? Your pet is supposed to go to the vet once a year for a wellness check. If you need a reason to get them to a vet, here's one. 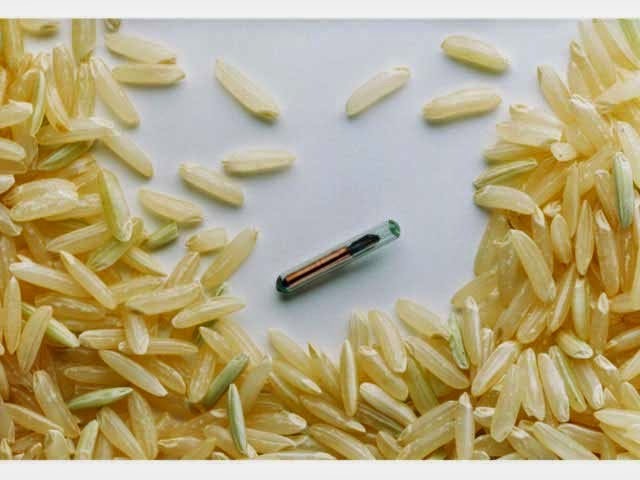 Still need more info on microchipping? Check out some of the blogs listed below. 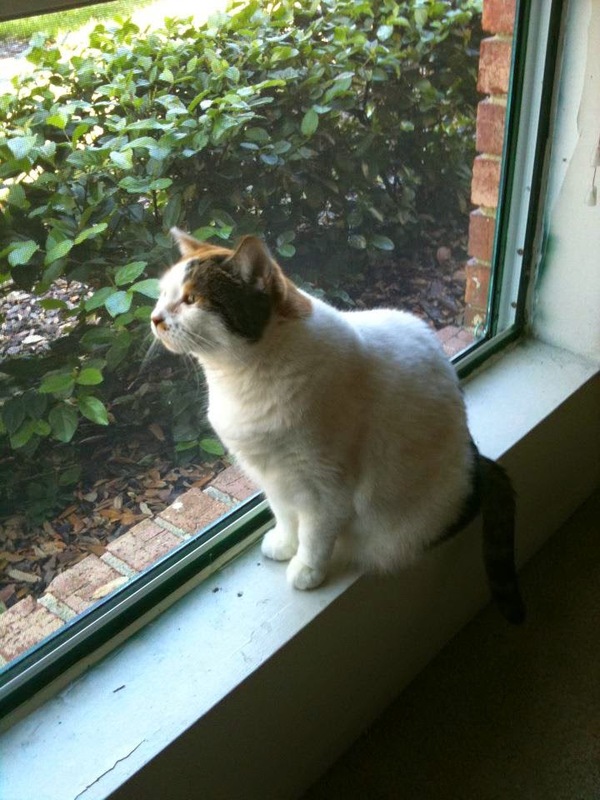 My cat is senior in this house, though she may not be the dominant animal in the house. My brother got Galadriel in 2003. 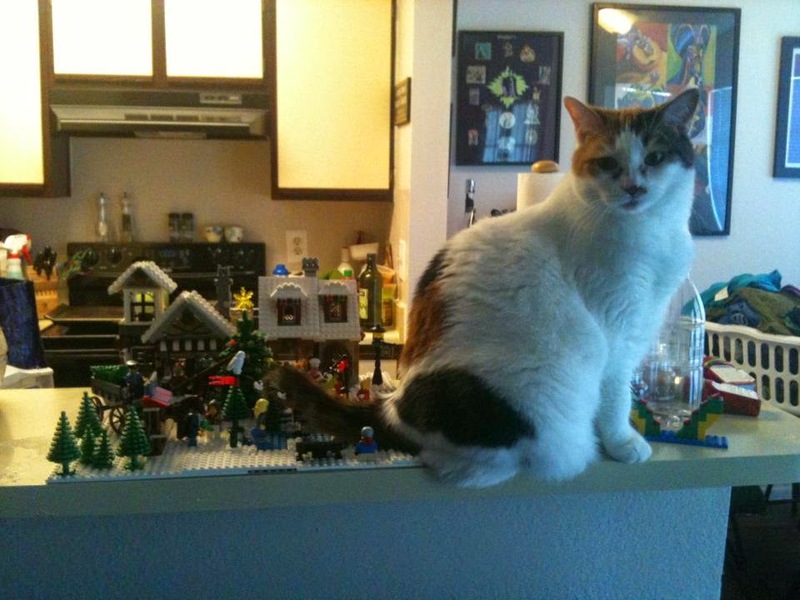 She was already 2 or 3 years old, the shelter said. So that makes her either 13 or 14 years old. She has been with me ever since. She isn't cuddly, she hates to be picked up. But she shows affection in her own way. And it's comforting having her around. 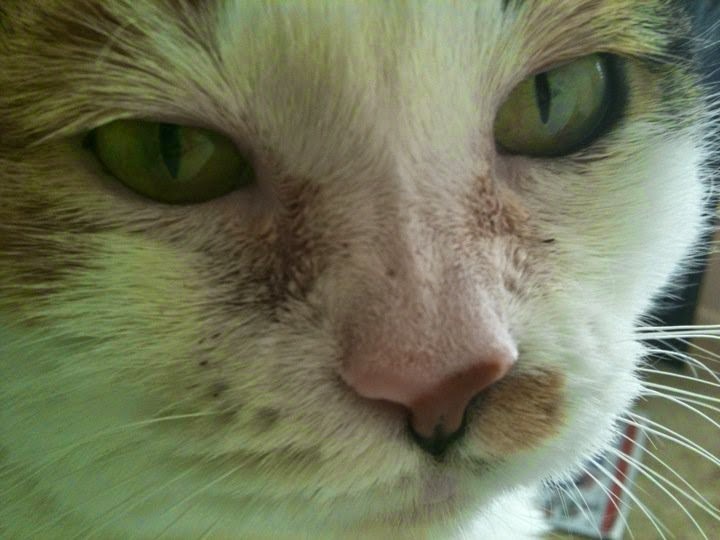 Here's some pics of Galadriel from over the years. 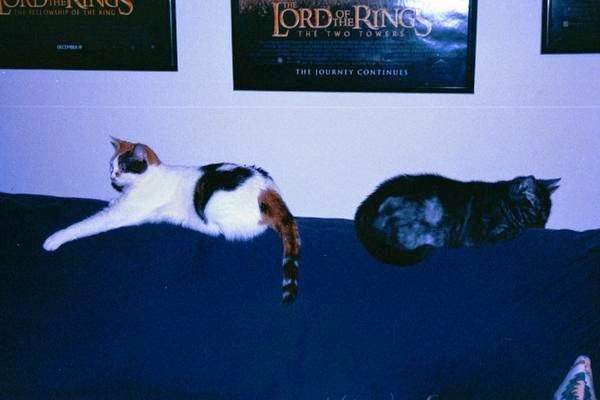 Galadriel with Koko (OTRB) circa 2004 or 2005. 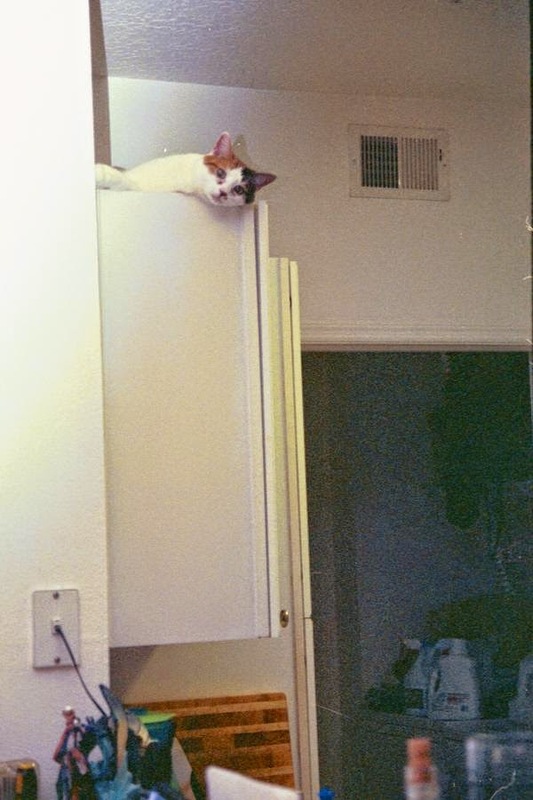 On top of a kitchen cabinet. She used to be quite the jumper. Look at the awesome box we got from Merrick -- It's got all kinds of doggy treats inside. I like to make sure Lulu and Jasmine are doing things and learning for their treats. I try very hard not to just hand them a cookie. But some tricks and behaviors are more important than others. And I also have to make sure my girls don't lose their figure eating treats. So here are the treats I like to use -- and why I use them. 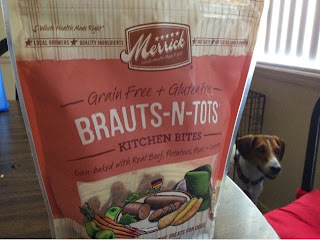 Merrick Kitchen Bites: These are small doggy biscuits made by Merrick and come in the company's canned food flavors. We particularly love the Brauts n Tots one because we think chicken makes Jasmine itchy. Why I like these: Grain free, gluten free, and small. I like to use these for little midday treats, particularly when I need to get the dogs in the house, or I need to get Jasmine in her crate so I can go to work. They are crunchy, but not particularly stinky. 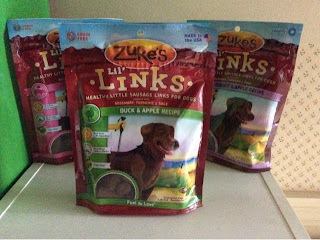 Zuke's Treats: Zuke's treats are made in the USA or New Zealand. They are flavorful treats, and they aren't big treats. I like the Lil' Links and the Hip Action treats. Why I like these: The treats are small enough to give the girls a taste of something good. I like to use them when we're out and about to keep their attention. For instance, I gave them to Lulu during outdoor photo shoots. I also used them to maintain her attention while at farmer's markets and the post office. They aren't too fattening, and the Hip Action have the added bonus of having glucosamine. We have a small stash. Natural Balance Food Rolls: My trainer, Adam at Petco, is the one who coined the term "puppy crack." It's the truth. Dogs will do almost anything for some food rolls. They are also Made in the USA. Why I like these: The food rolls can be broken apart or cut. You can mold them into a ball. They are incredibly stinky. And with a beagle that can be a great help. I save these for training because it's helpful in keeping them focused on you. They love the taste and smell. Now I say this all with the understanding that Natural Balance changed the recipe recently. The roll is crumblier and not as easy to use. But from what my trainer understands, NB has gotten so many complaints they are changing back to the old recipe. Peanut butter: I kid you not. Lulu can hear a jar open from half the house away. If I have peanut butter Lulu wants a taste. So I make it very special. For instance, pills. I put the pill in the middle of the peanut butter and she takes it in one go. Jasmine is a bit more judicious, licking and licking. But she still goes for the pill at the end. Why I like it: Ummm peanut butter is tasty? No seriously, I can buy a jar and share it between the dogs and I. Cheaper than treats, good for the dog and when they know it's extra special they'll do anything. Just try to buy one that doesn't have lots of sugar. Jones Natural Chews rib bones: There are lots of ways to keep your pets busy, but I like these bones. Plus, stripping bones is good for doggy teeth. Why I like these: All natural, made in the USA. No preservatives. Plus, Lulu finds these beef rib bones easier to chew. She likes her bones not to big, not too small. 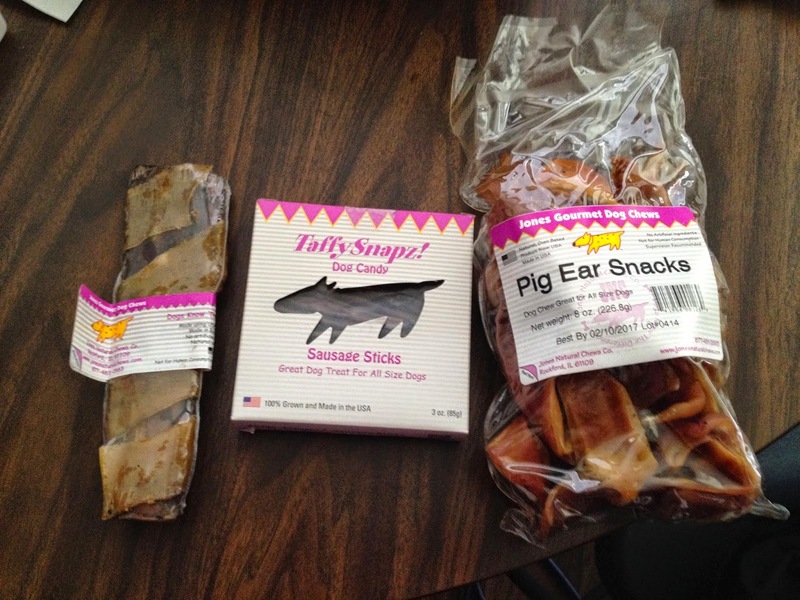 Plus, Jones also sell a "rib roller," a beef bone wrapped with pig skin. The dogs really like those! What are your favorite treats for training? TELL US BELOW!